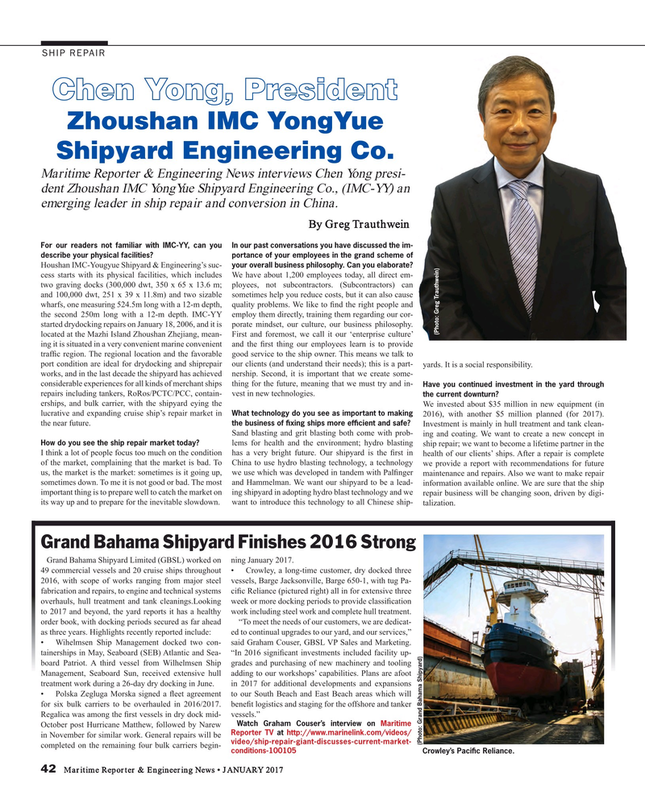 Maritime Reporter & Engineering News interviews Chen Yong presi- dent Zhoushan IMC YongYue Shipyard Engineering Co., (IMC-YY) an emerging leader in ship repair and conversion in China. For our readers not familiar with IMC-YY, can you In our past conversations you have discussed the im- describe your physical facilities? portance of your employees in the grand scheme of your overall business philosophy. Can you elaborate? Houshan IMC-Yougyue Shipyard & Engineering’s suc- cess starts with its physical facilities, which includes We have about 1,200 employees today, all direct em- two graving docks (300,000 dwt, 350 x 65 x 13.6 m; ployees, not subcontractors. (Subcontractors) can and 100,000 dwt, 251 x 39 x 11.8m) and two sizable sometimes help you reduce costs, but it can also cause wharfs, one measuring 524.5m long with a 12-m depth, quality problems. We like to ? nd the right people and the second 250m long with a 12-m depth. IMC-YY employ them directly, training them regarding our cor- started drydocking repairs on January 18, 2006, and it is porate mindset, our culture, our business philosophy. (Photo: Greg Trauthwein) located at the Mazhi Island Zhoushan Zhejiang, mean- First and foremost, we call it our ‘enterprise culture’ ing it is situated in a very convenient marine convenient and the ? rst thing our employees learn is to provide traf? c region. The regional location and the favorable good service to the ship owner. This means we talk to port condition are ideal for drydocking and shiprepair our clients (and understand their needs); this is a part- yards. It is a social responsibility. Have you continued investment in the yard through repairs including tankers, RoRos/PCTC/PCC, contain- vest in new technologies. the current downturn? erships, and bulk carrier, with the shipyard eying the We invested about $35 million in new equipment (in lucrative and expanding cruise ship’s repair market in 2016), with another $5 million planned (for 2017). What technology do you see as important to making the business of ? xing ships more ef? cient and safe? I think a lot of people focus too much on the condition has a very bright future. Our shipyard is the ? rst in health of our clients’ ships. After a repair is complete of the market, complaining that the market is bad. To China to use hydro blasting technology, a technology we provide a report with recommendations for future us, the market is the market: sometimes is it going up, we use which was developed in tandem with Pal? nger maintenance and repairs. Also we want to make repair sometimes down. To me it is not good or bad. The most and Hammelman. We want our shipyard to be a lead- information available online. We are sure that the ship important thing is to prepare well to catch the market on ing shipyard in adopting hydro blast technology and we repair business will be changing soon, driven by digi- its way up and to prepare for the inevitable slowdown. want to introduce this technology to all Chinese ship- talization. Grand Bahama Shipyard Limited (GBSL) worked on ning January 2017. 49 commercial vessels and 20 cruise ships throughout • Crowley, a long-time customer, dry docked three 2016, with scope of works ranging from major steel vessels, Barge Jacksonville, Barge 650-1, with tug Pa- fabrication and repairs, to engine and technical systems ci? c Reliance (pictured right) all in for extensive three overhauls, hull treatment and tank cleanings.Looking week or more docking periods to provide classi? cation to 2017 and beyond, the yard reports it has a healthy work including steel work and complete hull treatment. Reporter TV at http://www.marinelink.com/videos/ in November for similar work. General repairs will be video/ship-repair-giant-discusses-current-market- (Photo: Grand Bahama Shipyard) completed on the remaining four bulk carriers begin- conditions-100105 Crowley’s Paci? c Reliance.